Camellia japonica is the most widely known and grown of the Camellia species and comprises literally thousands of named varieties, usually referred to simply as "Camellias". 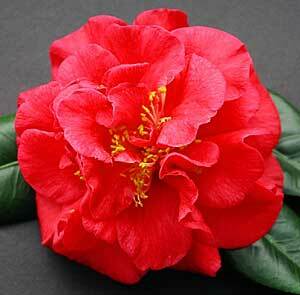 Many Camellia japonica have now been crossed with other species and some of the resulting hybrids have been included in this section together with a number of species belonging to the genus Camellia. Listed in our online Japonica catalogue are the selected best of the hundreds of varieties this nursery has grown and carefully observed over many years - chosen to cover the charming and infinite variety of size, colour and form provided by this species and particularly for their individual qualities and beauty. Whilst we are continually testing new varieties, only those superior in form, colour and general excellence will be listed. Enthusiasts will find some newcomers in the following listings. We emphasise the necessity to refer to the Classification of Forms of Camellia Blooms when reading individual Camellia varietal descriptions. Note: All japonica and miniatures do need some summer protection during the day to prevent foliage burning. Bob Hope, Coral Delight, Dahlohnega, Nicky Crisp. Brushfield's Yellow, Buttons 'n Bows, Black Lace, Carter's Sunburst, C.M. Wilson, Courtesan, Desire, Easter Morn, Elegans, Elegans Champagne, Emperor of Russia, Emperor of Russia Variegated, Erin Farmer, Fire Dance, Grand Marshall, Grand Slam, Great Eastern Happy Holidays, Hawaii, Laurie Bray, L.T. Dees, Magnoliflora, Margaret Davis, Margarete Hertrich, Moshio, Mrs D.W. Descanso, Nuccio's Gem, Paradise Illumination, Peacock, Polar Bear, Red Red Rose, R.L. Wheeler Variegated, Roger Hall, Satsuma Kurenai, Tammia, Waltz Time, White Nun, Wildfire. Betty Ridley, Black Magic, D. Herzilia, Dixie Knight, Drama Girl, Henry E. Huntington, Julia France, Lovelight, Maroon & Gold, Prince F. William, Royal Velvet, Silver Waves, Spanish Dancer, Wynne Rayner.